I use the softest — cloth." Years ago, an image of a lovely crystal arrived in my mailbox. That little gem not only caught my attention, it grabbed hold of my soul. In doing so, it launched a journey that has enriched my life. May you experience as much joy in viewing them as I have had in creating them. For the gems that are still available, the price is noted in the details. It's my pleasure to share with you my passion for light and color through classes, events, and now my new line of patterns, fabric, and publications. 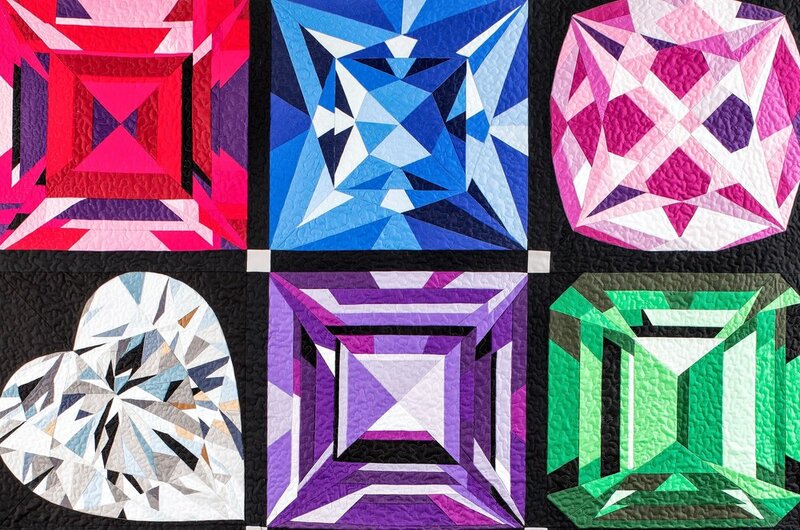 I have designed my patterns so that even a "confident beginner" sewist can create sparkling gemstones using the same techniques I use to create my giant gem portraits. A portion of the profits of The Birthstone Series is donated to Healing TREE (Trauma Resources, Education & Empowerment). Healing TREE is transforming how society responds to abuse and interpersonal trauma. For resources and information, visit www.healingtreenonprofit.org.